In an era in which public trust of traditional media is slowly rising from the low point of the phone-hacking scandals and the Leveson inquiry, the Panama Papers has brought us evidence of just how potent sustained, investigative journalism can be in helping to bring the powerful to account. As veteran editor Peter Preston wrote in the Observer, this is an example of how journalism has “crossed borders” to shine a light on global corruption. To break the story, the International Consortium of Investigative Journalists, assembled a team of some 400 media workers in more than 80 different countries to systematically work through 11.5m digitised documents leaked from law firm Mossack Fonseca relating to how the worlds rich and powerful use tax havens. In the Conversation, JOMEC Professor Richard Sambrook, formerly director of global news at the BBC,assessed the international impact of the ICIJ and concluded that in the future we can expect more leaks, more international collaborations and more revelations to embarrass the political and business elites. The Panama Papers, he wrote, will be discussed for many years to come. For Dominic Ponsford in the Press Gazette, the investigations – which involved the Guardian and the BBC’s flagship current affairs programme, Panorama – showed how journalism can change the world. In Iceland, the prime minister, Sigmundur Gunnlaugsson, resigned over allegations that he had concealed millions of dollars in an offshore company. Argentina’s federal prosecutor, Federico Delgado, asked for an investigation into any connection between the president, Mauricio Macri, and offshore companies. And, of course, in the UK, David Cameron has come under sustained and unprecedented pressure from the press to reveal details of his tax activities. It should be remembered that in the UK the Guardian and the BBC have exclusive access to the Panama Papers database, which effectively means that the rest of the media is feeding off what those two institutions choose to make public. And it is interesting how vehemently the centre/right wing newspapers have targeted Cameron and, for that matter, George Osborne. 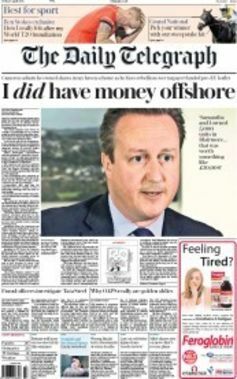 The normally loyal Daily Telegraph ran its front-page story on April 8 with the headline: “I did have money offshore”. The italicisation here is important, of course – the reader is meant to infer from this that the prime minister has changed his story and that the reality of the situation is far removed from what was once communicated. Elsewhere in the paper, Cameron was called out for his hypocrisy. A piece by the paper’s deputy political editor, Steven Swinford, was headlined: “David Cameron’s tax affairs: the unanswered questions.” Swinford reported that Cameron’s failure to clarify his tax affairs sooner has led to accusations that he “has been less than honest”. By Sunday, April 10, the attack was full on across the range of titles. Press pack on the attack. The Sunday Times had a front page with the PM’s forlorn features photographed against a yellow background with the strapline: “PM reveals hidden wealth.” The Mail on Sunday ran with the lead: “Cameron tax bill dodge on mother’s 200k gift.“ The Sunday Telegraph led with: “Cameron in line to avoid inheritance tax of 80k.” For the Observer, this was a “Panama” crisis. It’s a very persuasive argument, given the anti EU stance of the majority of the British press and – as I’ve written before – the question as to why the right-wing press is so anti-EU may be partially answered by considering the ideological and business interests of their owners. Murdoch’s position is well documented. The owners of The Telegraph, the Barclay brothers, turned the European weekly newspaper into a “tabloid-style news magazine with a Eurosceptic vocation” and the endorsement of UKIP by Richard Desmond, owner of the Express and Star, couldn’t be plainer. 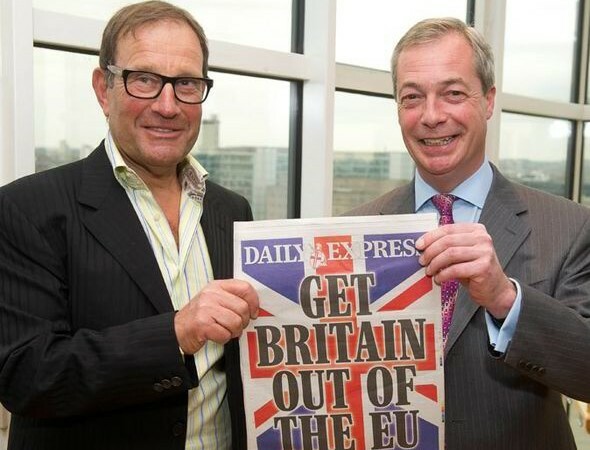 Consider the image of Desmond and Nigel Farage holding an edition of the Express whose front page is a union flag embossed with the slogan: GET BRITAIN OUT OF THE EU. All this aside, these recent attacks on Cameron are unprecedented and show no signs of slowing down. Is it conceivable that he may be forced into resignation before the referendum on June 23? Strange times:ppl call for Cameron to go-but need him to stay til referendum or they’ll choose a Brexiteer PM.I’m backing Cameron? ?Gd grief. Strange times indeed – and the prime minister on the front page of the Daily Mail the day after all those wearying Sunday newspaper stories looks a weary man, spectacles perched over the nose, tie loosened – confused and yet concerned. 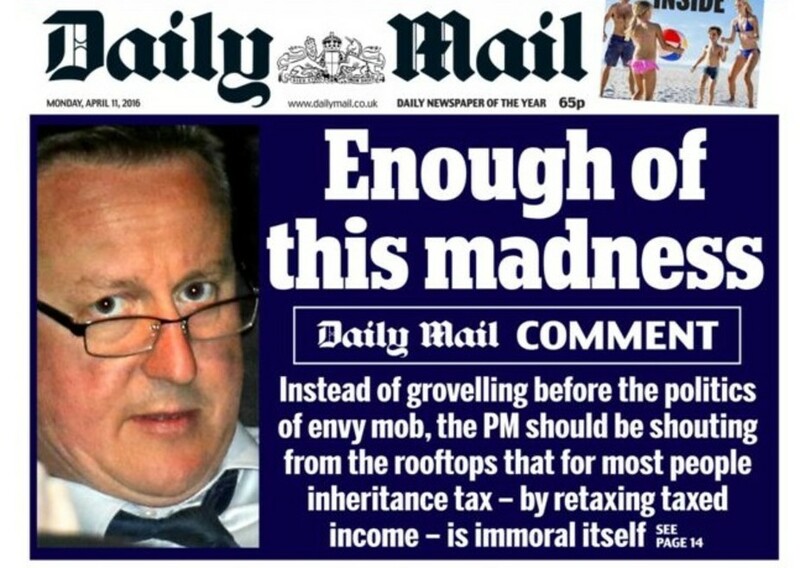 “Enough of this madness” implores the headline. But the current frenzy resulting from the Panama Papers and the now pressing debate over the publication of tax returns will ensure that the madness does not end for quite some time. ← The Panama Papers: How does an international investigation work?